I wrote a post a few months back asking Should we teach cursive handwriting to our kids? (Spoiler alert – I think the answer is yes!) I knew all along that I would want to incorporate cursive handwriting lessons into our homeschool but I was afraid it would be met with resistance. So I put it off for our first year. I said 2nd grade would be better. Well, towards the end of our 1st grade year BigG spotted a cursive book I had bought and his eyes lit up. He said, “When am I going to learn THAT?” I told him 2nd grade. But he begged, and pleaded and begged some more so on the last day of first grade I taught him how to write his name in cursive. I realize that’s probably not the way you’re supposed to but it made him happy. He wrote his name in cursive all summer long. And then when it was time to go “back to school” learning cursive was a huge motivator! 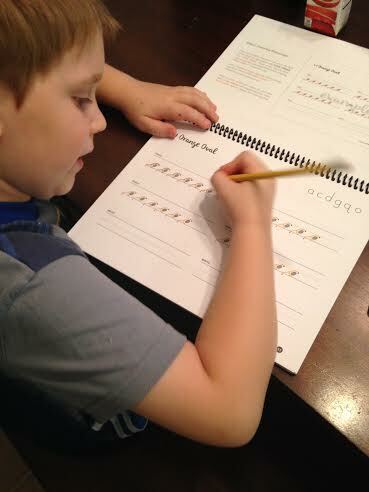 In fact for the first few weeks we started our day with cursive because it put him in a good, cooperative mood. I know…this has been the weirdest experience. LOL. So we were using (to not name names) a “traditional” cursive handwriting program. The same one I used in private school to learn cursive when I was his age. But I realized that I just didn’t write like that anymore. It’s not that I don’t write in cursive anymore, I do. But this way….it was so….flourished. With a lot of unnecessary loops that I just didn’t do anymore. I was having to re-teach myself so I could teach him! See how much sense that makes! The program we were using taught one letter at a time. But when you group them together based on similar strokes you learn much quicker and much more efficiently. Plus, you’re practicing connections from the beginning instead of just one letter at time. Each string of letters is also assigned it’s own color and nifty little phrase to help you remember what you’re making. Needless to say, we ditched our original program to continue on with Cursive Logic! BigG is learning quicker than with the old program and I’m not having to re-learn all the loop and flourishes that I abandoned in handwriting years ago. This really is the logical way to learn cursive! 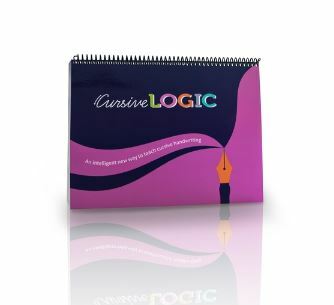 Would you like to win your own Cursive Logic workbook? Awesome, because I’m giving one away! If form doesn’t load click on “a Rafflecopter giveaway” to get to the form. Winner will be notified using the email address provided in the form. Winner will have 48 hours to respond or they forfeit their prize. I was provided with CursiveLogic notebooks to review. I was not paid for my review. All opinions are my own. Cursive – YES! I’m all for teaching the reading & writing of cursive. I’m inspiring my own kids through printables all related to dragons! I’m looking forward to checking out your blog for cursive resources!